Spidi Leathers has come on board as a new sponsor at the Vauxhall International North West 200 and will back the opening Superstock race on Thursday, May 14. The Italian leathers manufacturer now joins Shoei, the sponsor of Metropole corner, and Sidi, sponsor of the start line digital clock, as the third brand operating under the Feridax banner to be involved with the famous seaside meeting. Steve Clifford, Feridax Sales Director, said: “Our relationship with the North West 200 as a burgeoning road racing brand and the continuing growth of road racing in general provides us with a fantastic opportunity to be involved with this exciting industry and we are immensely proud to be involved with the whole team behind the event. 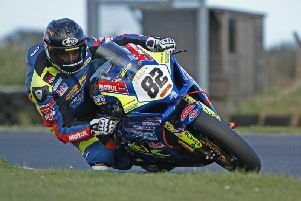 Shoei are now the official safety partners of the North West 200, with all travelling marshals wearing Feridax products.